The Collector for ArcGIS and Operations Dashboard for ArcGIS apps were recently updated with notable enhancements to better support users’ workflows. These apps pull together and disseminate your most current geographic data while connecting the activities of your field and office staff. Collector for ArcGIS is a native, configurable field data collection app to improve the accuracy and currency of spatial data. It is designed specifically for iOS and Android devices. The Collector app is a companion to Operations Dashboard, but it can also be used in a stand-alone environment. Field crews can download maps using Collector and then capture spatial or tabular data, attach photos and video, plan routes, and get directions. Information can be transmitted and immediately displayed in Operations Dashboard and shared throughout an organization. Collector now has the ability to work in a completely disconnected environment. 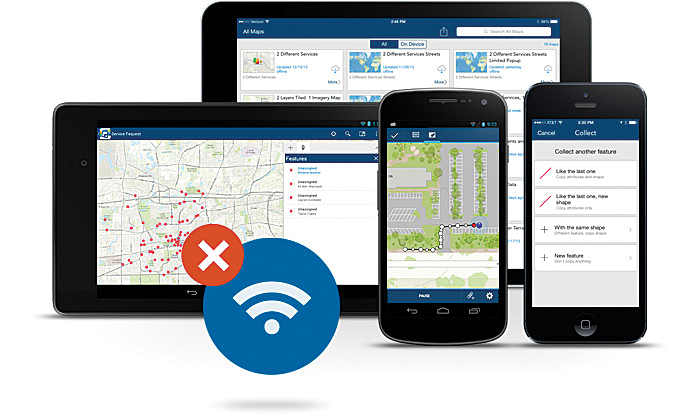 Maps can be downloaded to users’ smartphones and tablets and accessed anywhere, regardless of network availability. Users can take maps offline to collect and edit information in remote locations where network connections are either nonexistent or unreliable and then synchronize changes when reconnected.